I am so excited to post my first clipart and it is FREE!! These are some cute fuzzy balls that I have created. 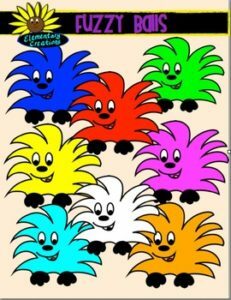 I have included 7 colored ones and 1 BW set a total of 8 Fuzzy Balls. My clipart can be used for commercial or personal documents, lesson, or resources. If distributing my clipart I ask that you secure it in PDF. I also do ask that you give credit back to me somewhere in your document if you wish to sell it.